The Witches’ Ladder is a technique for working a spell, and quite simple to do. 1 length of cord Silk cord is nice, but anything will do ie. a piece of string, a shoelace, scarf or tie, etc... see variations as well. Before you make your Witches’ Ladder you must first be clear on what it is you wish to accomplish. The Witches’ Ladder can be used for any purpose, but it is best used to bring about something which is accomplished through an on-going process -such as increasing prosperity, learning a particular skill, losing weight, etc- rather than something which is accomplished in a single event. Start out with reasonable goals -skill is built through practice. Here is an example. Feel free to modify and make it your own. First, consecrate your items. If you've never done this, here's a simple rite to follow. You should do this in a quiet place by yourself. Begin by placing yourself in a comfortable position, then take three deep breaths and release each one very slowly. Now imagine a ball of golden light in the area of your heart. Say to yourself “I am One with the powers of the Universe,” and imagine that ball of light growing larger and brighter, radiating out in all directions like a sun inside you. Let the ball of light grow to fill your chest, growing stronger and stronger as it does so. Now, take your cord (and any other items you may be using, if you are doing either of the variations given for this spell) and place it before you. Make three Tuathail, or counter-clockwise, circles above the cord with your hand. Say something to the effect of “ I cleanse and purify you, sending out for you any impurities which may lie within.” Imagine the cord surrounded by a golden light. Imagine it shining brightly, then let the image fade. Make three Deosil, or clockwise, circles above the cord and say something like: “I bless and consecrate you to this purpose!” Imagine the cord surrounded by a blue-white light, shining brightly. Again hold the image for a moment, then let it fade. Once consecrated, take the cord in your two hands, or hold your hands to either side of it (palms facing it). Imagine a ball of white light between your hands, surrounding the cord. Concentrate on the goal you wish to bring about through this spell -focus as hard as you can on the goal for several minutes. Imagine the goal inside the ball of light, or some image that represents the goal. See the goal as you want it to be when it is already accomplished and complete -if your goal is to gain a skill for example, imagine yourself already proficient in it. As you imagine this, know that this goal is already accomplished and only needs to be drawn into physical manifestation. Now let the image of the goal and the ball of light fade, and take up your cord. Continue to focus on your goal, seeing it already accomplished. Still concentrating on the goal, take the cord and tie a knot near one end of it. Imagine yourself one step closer to having your goal. Focus even more strongly on the goal, knowing that each knot draws it closer. With each knot know that your goal comes closer to you, imagine it more strongly and know that it is truly yours. Once again, imagine white light all around the knotted cord, and place your hands above or beside the cord with palms facing it. Keep the image of your goal very firmly ensconced in your mind. Then, release all of your focused energy and concentration directly into the cord - imagine the energy flowing out of you in the form of light or water. When all of the energy has flowed from you into the knotted cord, take it and seal it in a safe place. It is best to bury it in the Earth, and especially good if you can bury it at the foot of a tree. This symbolizes the physical manifestation of the goal. In some cases you may wish to keep the Witches’ Ladder in your house, rather than burying it out of doors. You can do this by placing it in an Earth pot-a pot filled with soil and kept on the altar or a special place. Or you could make a special box or bottle for it. The simple technique used to make the Witches’ Ladder has many variations. These can add to the efficacy of the spell by deepening your connection to it. This deepening is accomplished by appealing to the Higher Self through symbolic means or “Keys.” Keys are aesthetic or symbolic elements which help you to make the Shift in Consciousness and access your Higher Self, thus facilitating magical work. Anything which appeals to you creativity or your sub-conscious, and puts you in a more “magical” mood can be a Key. Make your Witches’ Ladder using not one but several cords of differing color. 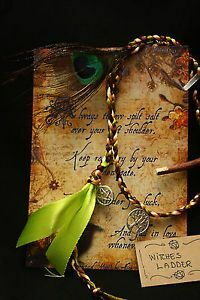 For example to do a prosperity spell you might combine a green cord, for fertility and abundance, with a yellow cord, for success. Or for psychic development you might select a dark blue cord, for psychic ability, a pale blue cord, for communication and learning, and a violet cord, for spiritual guidance. Instead of simply tying a knot, tie something into the knot. 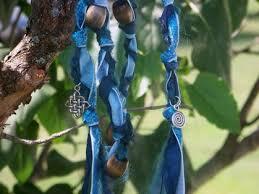 You might use beads, or twigs, or feathers -to give just a few examples. Then tie one into each knot as you work the spell. *notes: the first photo is from an old ebay ad which is no longer running. Content comes from one of my very old books of shadows.